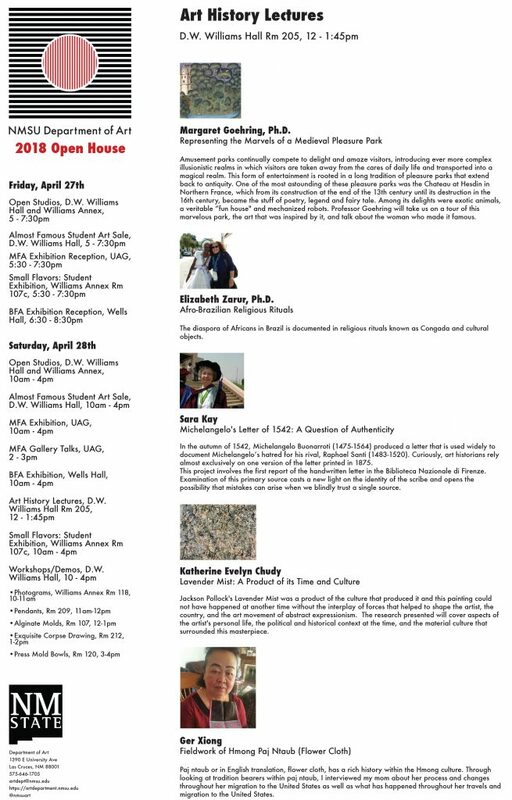 2018 Open House is Around the Corner! 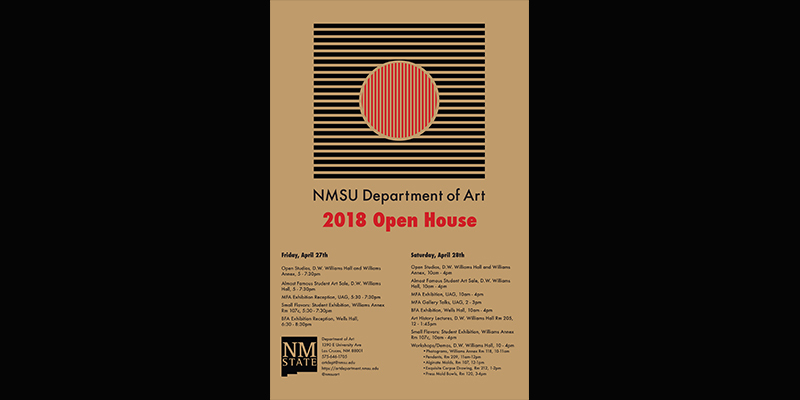 The Department of Art at New Mexico State University is pleased to host our 2018 Open House on Friday, April 27th from 5-8:30pm and Saturday, April 28th from 10am-4pm in D.W. Williams Hall, Williams Annex, Wells Hall, and the University Art Gallery on the Las Cruces Campus. 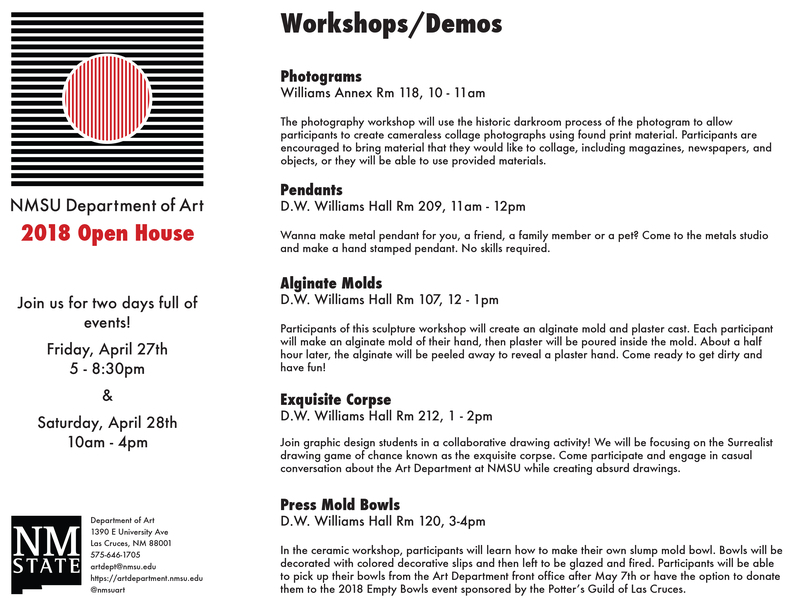 The Department of Art will open its doors to community members, current and prospective students, and families visiting NMSU. Visitors are encouraged to explore the facilities, meet our graduate students, participate in workshops, and view the work that our students have been creating. In addition to the various lectures, workshops, and exhibitions throughout D.W. Williams Hall and Williams Annex, the Spring 2018 BFA and MFA graduates will have work on display in formal thesis exhibitions. Support student travel and research by purchasing one of a kind student artwork at the Almost Famous Student Art Sale. Department of Art t-shirts will also be available for purchase. The 2018 NMSU Department of ART Open House is free and open to the public. This event is a great opportunity to find out what our department is all about! For more information, please call the department of art main office at 575-646-1705 or visit our website at https://artdepartment.nmsu.edu. Additional information can be found on Facebook and Instagram @nmsuart. Below find the list of activities and workshops going on during our 2018 Open House.